Facial treatments are a time honoured tradition in many cultures. They have prepared princesses to be presentable for the king, have medicinal properties to cure skin ailments and sooth the emotions of the stressed and over worked. Although times have changed the need for facial treatments has not. At Soho Skin Management or Soho Skin Bar Banyo we believe that good skin health requires regular facial treatments to ensure your most important protective asset, the skin, is in it’s best barrier protection equilibrium. Revive your skin & be out the door in as little as 15mins. Quick age defying skin cleansing treatments for those on the go. Regular facials shed skin damage & speed up cell renewal. Customized resurfacing ensures your skin gets exactly what it needs. We only use ethical, clinical & natural skincare in our facials. Applied directly to the skin fruit acids & skin boosters contain skin health essentials. Learn the tips and techniques to apply perfect brow makeup at home. Choose Banyo as your therapist to secure an online booking at our Banyo Brow Bar. Get the best out of your homecare regime. Our Skin Health Professionals will guide you through the best clinical skincare lines to achieve the results you are looking for from your home skincare regime. Every persons skin requirements are unique and as such a personally prescribed skincare regime will give you the tools to reach your skin health goals. Redeemable on Product Purchases in this visit. Choose Banyo as your therapist to secure an online appointment at our Banyo Skin Bar. Our Skin Health Professionals know what each skin type and varying conditions need to restore optimum skin health. A quick skin assessment every 3 months will ensure you are ready to handle the coming seasonal change with the right clinic treatments and homecare. Redeemable on Product or Treatment Purchases in this visit. Choose Banyo as your therapist to secure an appointment at our Banyo Skin Bar. No vanity here. Fruit acid peels have been a staple skin health treatment for more than 20 years. A monthly skin peel will leave your skin fresh, clean and ready to receive age defying nutrition. This is one habit you will be grateful for when you look fantastic in your 60’s. Fruit acid and enzyme skin peels are the quickest and non invasive way to brighten, hydrate and smooth out the skin. With a variety of AHA, BHA, Vitamin, Glycolic, Lactic and Enzymatic Skin Peels to choose from, our skin therapists will customize your peeling treatment to suit your needs. *A Mini Peel in 15 minutes. No fuss. No downtime. Just results. A lactic acid & multivitamin A, C & E peel for bright, hydrated skin in a flash. Ideal as a party peel. Choose Banyo Beauty Salon as your therapist to secure an online booking at our Banyo Skin Bar. An AHA Peel to refine the skins surface. Smooth away fine lines, wrinkles, sun damage & neglect with Glycolic Acid skin refining. When surface facial scrubs are not enough. Diamond microdermabrasion is a popular skin health treatment for oily & congested skin types due to its ability to reduce blackheads. * Pores are refined, toxins are drained and surface scar tissue is faded to reveal healthy skin cells ready to benefit from skin balancing serums & lotions. *Smooth away dead skin, irregular texture and deeply clean the pores with our bespoke microdermabrasion facials. We will reveal fresh, illuminated and refined skin in no time. A more thorough fruit acid & enzyme deep pore cleansing with microdermabrasion skin polishing. Following our ritual fruit acid cleanse & desincrustation, diamond head microdermabrasion is used to polish, stimulate & deeply clean the skin. To complete your treatment our facialist will infuse custom serums & massage intensive spa hydrators into your skin. A must for sun damage on the neck & décolletage. When you know microdermabrasion is not enough add extractions for extra pore clearing power. Adding a pigmentation peel after your microdermabrasion will get you better results at fading sun damage, pigmented scarring, dyschromia & melasma. Detoxifying Marine Mask is applied after microdermabrasion to draw out impurities & nourish the skin. The ideal addition for very congested & blackhead prone skins. Maree Andersen & The Soho Philosophy – Clinical results can be achieved without compromising the spa facial experience. Our Signature Facials in Brisbane have been designed to address your skin health concerns while allowing you to relax and unwind with traditional beauty rituals. We provide all facial treatments from acne extraction facials thru to luxurious, aromatic relaxation facials. Gentle botanical pore refining, exfoliating & skin balancing facial for all skin types. Deep Cleansing Facial. Blackhead clearing steam & extraction facial for ultra clean & refined pores. A customizable fruit acid peeling facial with ultimate intensive hydration infusion massage to leave your skin radiant with a dewy complexion. A luxurious payot skin hydration facial. Ideal for dry & irritated skin to calm & hydrate the complexion without causing discomfort. Only available at our Banyo Beauty Salon to secure an online booking at our Banyo Salon. Infuse radiance, nutrition & hydration into a dull, blotchy & red complexion with oxygenating, brightening & illuminating magnetic actives. Only available at our Banyo Beauty Room for online booking at our Banyo Beauty Salon. An aromatic lifting, revitalizing & collagen stimulating facial that increases circulation to nourish, lift and revitalize the skin. 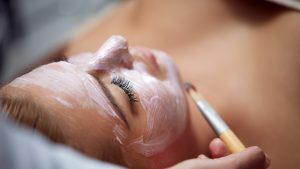 How often should I have a professional facial? As the skin regenerates and produces fresh skin cells daily you will find that most often healthy skin is in need of a professional facial treatment every 30 days. This allows your facialist to assess your skin for hormonal and environmental changes that can affect the balance and health of your skin. How do I know which facial treatment or peel is best for me? Our facialists are skilled skin professionals with certifications in anatomy & histology of the skin. This knowledge enables them to ascertain the source of any arising skin conditions and concerns and chose the the facial treatment best suited to your specific needs. I don't have time to fit a facial into my schedule? We know life can be hectic so we have quick 10 min medi peels that mean you can have your clinical skin peel each month quicker than it takes to order a cup of coffee and enjoy it. Will one deluxe facial give the enough results to last a year? One Luxury Facial, for instance, will certainly brighten your skin and highlight your eyes. In order to keep the skin and brows tidy you will need to have repeat treatments every 4 – 6 weeks and use skincare prescribed for your skin needs to look your healthy best. Do you have facial membership options that reward our loyalty? Yes, in order to get the most value out of your weekly, fortnightly or monthly skin, nail, waxing and brow treatments you can purchase a course of 6 treatments for a 25% discount. You are welcome to do this from your first visit.